As the first Pearce race of the season got closer the forecast got wetter. In the days leading up to it the track got changed, the camping field got closed to cars and vans were relocated on the fire road. People changed plans and booked accommodation elsewhere and the site was very quiet and empty on Friday night when we arrived. I was surprised to hear from friends that the track was dry. Then about 9pm the rain started and it didn’t stop until the following morning. I set off on my track walk and there was not a single dry thing in sight! The track was using a different top and bottom section this year so I only recognised a short section in the middle. The track was split into 2 halves, a loamy rooty wooded section at the top and wide open muddy berms and jumps at the bottom. Practise started a bit quietly on Saturday morning as many people looked gloomily at the rain but once on track the atmosphere started to improve. I was feeling really nervous, it was my first race of the season and I knew I hadn’t been on my bike enough. The track was slippery and we started practice off slowly and the track seemed OK. Then, as we started to pick up the pace, my lack of riding and confidence showed. I couldn’t stay on the track, I couldn’t find any flow and I was backing off everything rather than attacking it which made it all so much harder. I knew this but couldn’t seem to find my confidence so just got more frustrated as the day went on. I watched my friends vanish in to the distance and was constantly caught up by other riders which was tricky as there were very few passing places on the narrow track. 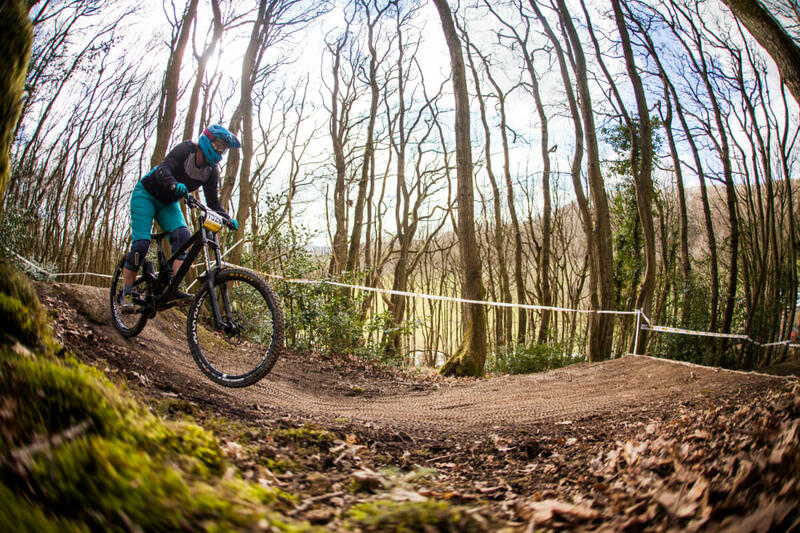 Rachel Atherton was racing and we had a fan girl moment when we shared the uplift with her. We were cool enough not to ask for autographs but only just! She chatted about lines and riding after injuries and didn’t seem fazed by our nervous fan girl chatter at all. People were crashing a lot and at one point we watched only 10% of people clear a tight rooty corner. The track was flagged constantly but the awesome marshals and commissaire team kept it moving. As practise drew to a close I had spent more time roaming around the undergrowth than I had between the tapes and was feeling decidedly unhappy. My confidence was about as low as it could be and I was frustrated with myself for not being able to sort it out. A crash had left me with a sore thumb and I still wasn’t 100% on my race lines. Sunday dawned sunny and cold and the track started to dry up. I was feeling a little more confident and slowly it started to come together. The track was changing constantly with some big ruts appearing and baking hard in the sun. By my last practice run I still hadn’t managed to ride the track cleanly but I was starting to feel as if I could actually ride a bike. I lined up for my first race run and finally felt like I wanted to be there. I still didn’t get a clean run with a slide out in a corner and a head on with a tree but I wasn’t as far behind the rest of the pack as I had been over the rest of the weekend. I was sitting in last but felt happier than I had done all weekend. My second race run was the cleanest run I had all weekend but I hadn’t had the opportunity to practise the track at speed. I struggled with my line choices which had been made at about half the pace I suddenly found myself at! I made it over the line without having a single crash and took 5 seconds off my time. I finished in last but unusually I wasn’t unhappy with it. I was unhappy with my riding but when I looked at the strong field of ladies I knew I’d managed a decent run in the end and my final time was so much better than I had expected. All weekend the ladies supported each other and the camaraderie was just amazing. I really struggled with my head game and the only thing that kept me going up and trying again was the support from everyone else. I got messages from ladies after the weekend who took the time to offer words of support and encouragement. I wrapped it all round me like a big comfy onesie and felt all warm and fuzzy despite my less than pleasing performance. I looked at the race photos and it told me exactly what I expected. Pics from early in the weekend showed me crouched over my bike, hanging off the back, braking hard into everything. On a more positive note the pics from later in the weekend showed me standing up on the bike, attacking features and generally riding in a more positive position. When I looked at the race by race performance charts I had actually improved my percentage off category winner so I was heading in the right direction. Another positive to take away from the weekend was that my winter strength and conditioning appears to be working! I felt strong on the bike, my bad shoulder gave me very little trouble and my recovery was great. I finished the weekend feeling strong rather than shattered and the next day I didn’t feel like I’d been hit by a bus. Now this might well have been because I didn’t ride well enough to really work hard on track but hopefully as my riding starts to come to together I’ll be able to make better use of it. My next race is only a week away and I can’t help feeling I’ve bitten off more than I can chew but there is only one way to improve and that is to get out there and keep on trying!